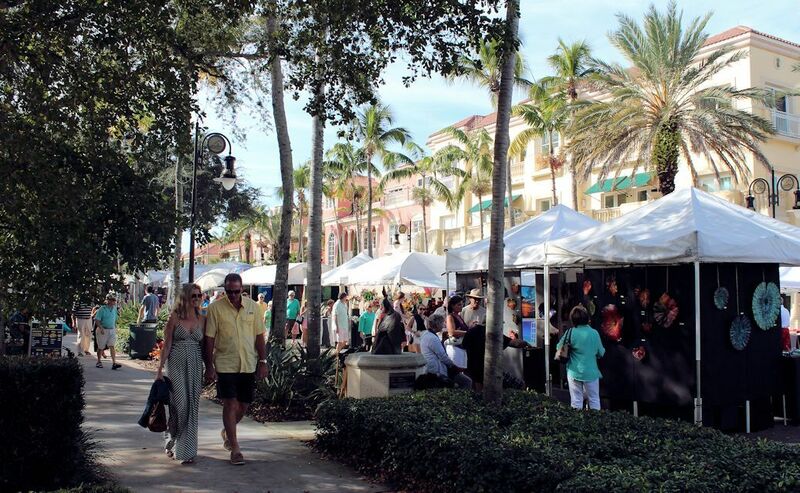 Place: The City of Naples police cordon off historic Fifth Avenue South to vehicular traffic for this vibrant downtown Naples outdoor art bazaar which drew 15,000 art lovers over two days last year. 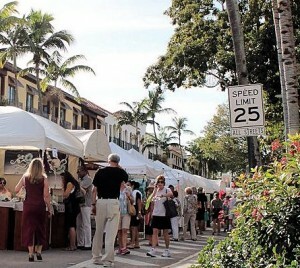 Besides a new year and new opportunities, part of the attraction to festival goers is their ability to casually amble through booths and tents set up under the tall oaks that shade this flower-adorned thoroughfare that’s framed by Mediterranean-style buildings housing banks, real estate and stock brokerages, European-style boutiques, high-end jewelry stores, prestigious art galleries and some of the finest ristorantes, bistros and outdoor cafes in all of southwest Florida. 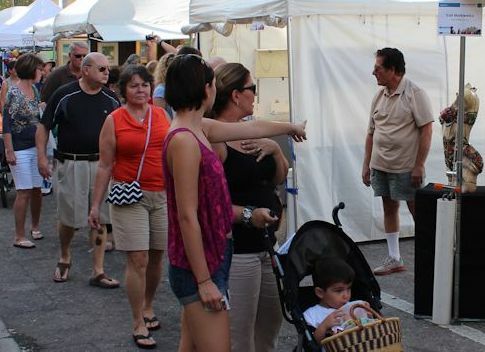 National Ranking: In its September 2017 issue, Sunshine Artist Magazine ranked this as the #20 art festival in the United States, and it has been in the top 100 eight years running. Description: This art festival offers residents and visitors with an alternative to football and a place to walk off calories from holiday overeating. Because of its national ranking and the beautiful weather in southwest Florida during this time of year, Naples National draws some of the finest artists in the country. 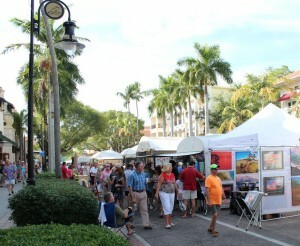 Last year, 190 national and local artists displayed artworks valued collectively at nearly $15 million in categories ranging from original oils and acrylics on canvas, panel and galvanized aluminum to watercolors on paper, 2D and 3D mixed media, limited edition prints, photography, digital art, metal sculpture, wood carvings, ceramics, hand-crafted jewelry, leather works and more. 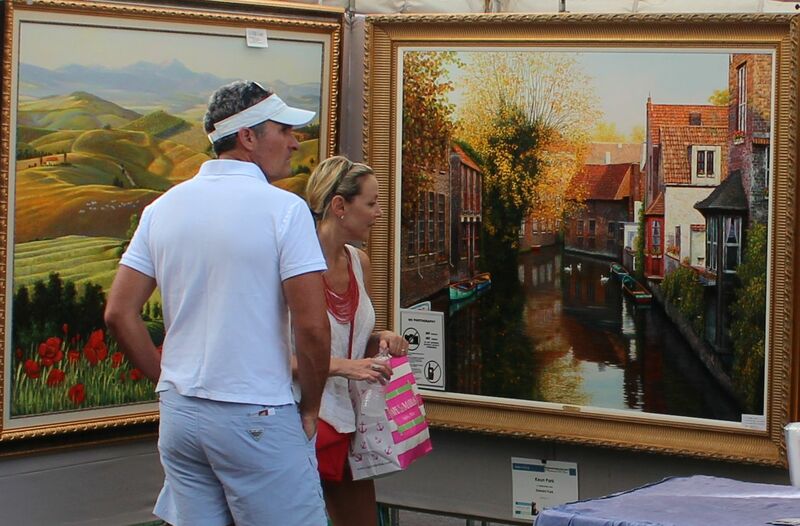 There’s lots of art for every taste and pocketbook, so bring your credit card or checkbook. 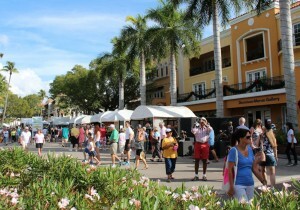 In addition to Fifth Avenue’s world-renowned bistros and restaurants, there will be plenty of carnival-style food kiosks to sustain hungry patrons. Augmenting the number of participating artists, available art and ambiance of the event on Saturday is Art in the Park, an art fair held on Park Street by Naples Art Association members on the first Saturday of each month between November and April. Unlike a gallery or museum, a fine art festival such as this one offers savvy art enthusiasts the unique opportunity to meet the artists in person; commission a specific piece; ask questions about techniques; learn the sources of their inspiration and purchase fine works of art directly from the artists. 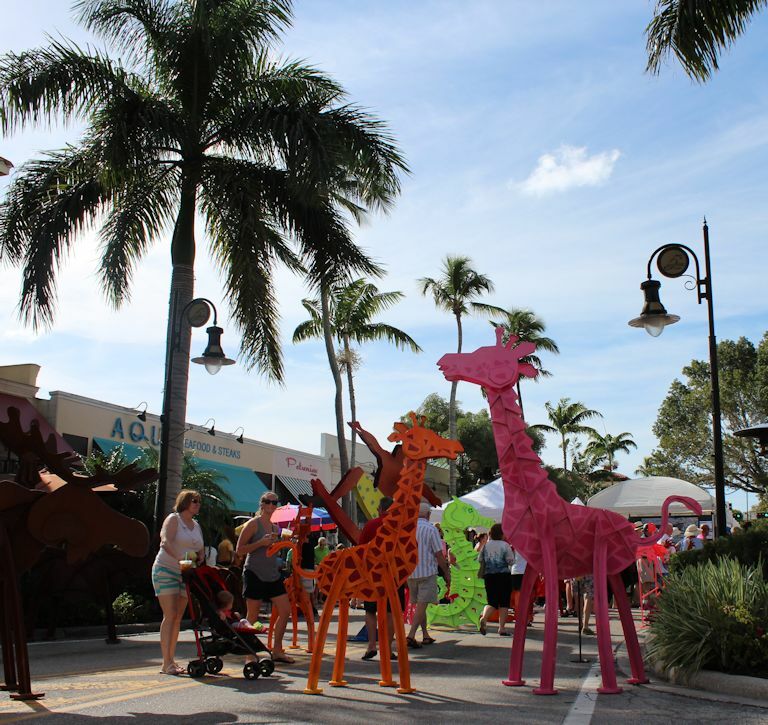 Parking: Parking is not a problem as there is plenty of free parking abutting Cambier Park and along the streets adjacent to Fifth Avenue South. Organizer: Naples Art Association, a 501(c)(3) organization founded in 1954 and whose mission is to promote and advance interest and participation in the visual arts. 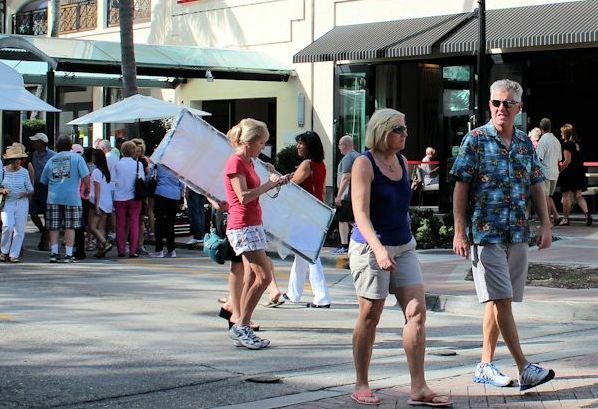 Event Director: Event Director: Don DeMichele serves as Outdoor Festival Director at the Naples Art Association. 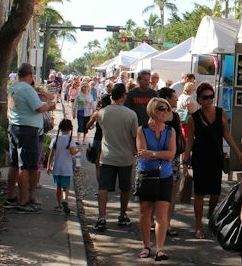 As such, Don is responsible for organizing, managing, advertising, and conducting NAA’s three large annual outdoor art festivals. 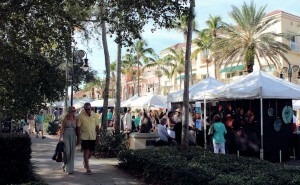 His duties include working with the city officials, police and fire departments, county officials, and the business district in setting up the shows, which average 260 fine art exhibitors, which involves shutting down Fifth Avenue South, road closures and using partner relationships to successfully execute the show. 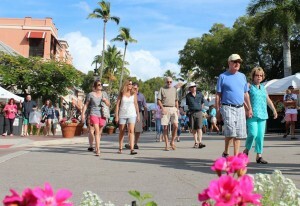 Several hundred artists from around the country vie for 200 coveted spots at this prestigious art festival. 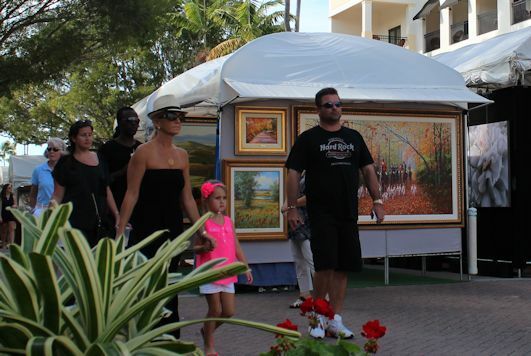 Artists are selected by independent jurors to ensure the best quality artworks for festival guests to enjoy and purchase.